Hi! Welcome to my turn on the Pixie Noel Blog Hop. Pixie Noel is Tasha Noel’s latest collection for Riley Blake and I am truly smitten. 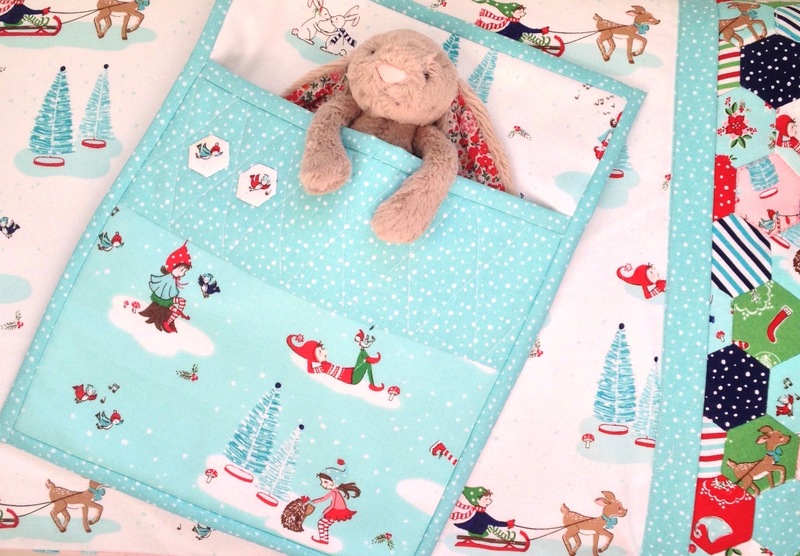 Like many people I am a huge fan of Tasha’s designs, with all of her previous collections being a big part of our handmade home – from nursery bunting and curtains, first birthday dresses and now our Christmas. As soon Pixie Noel arrived at my home I started making 1 inch hexies (seriously how could I not – hedgehogs AND deers ), but then I needed a project to display my sweet cheery hexies! Suddenly I was inspired by a previous and well loved item I had made – a pillowcase! Growing up we would leave out pillowcases (not stockings) on Christmas Eve, and with this sweet Christmas themed collection now my daughters will be able to do the same. I used Lisa from A Spoonful Of Sugar free tutorial for a hexie pillowcase, adjusting slightly to make the cuff completely out of hexies. The Pixie Noel illustrations are perfectly sized for 1 inch fussy cut hexies and even better a charm pack easily makes 42 hexies – all you need for the cuff on a standard pillowcase. With the little pieces of fabric I had left over I made a little sleeping bag for my daughter’s favourite bunny. I used the Honey Bear’s sleeping bag pattern from the S is for Sewing Book by Belle and Boo. A seriously cute idea, that is so simple to make I look forward to making more for gifts. Of course I couldn’t let the tiny pieces left over from making hexies go to waste (seriously those tiny blue birds are adorable). So I made fabric stamps using Amy Sinibaldi’s tutorial and then using Svetlana Sotak’s free pattern for a drawstring pouch I made a super cute and handy pouch to leave out – perfect for those tiny gifts that sometimes get lost on Christmas morning. So thanks to Tasha’s sweet illustrations Christmas in July has well and truly arrived in our home. My girls are already using the pillowcase, sleeping bag and tiny pouch (currently on a roster as I need to make one more of each item). And the best part is all these items featured in my blog hop post were made with 1 1/2 yards of Pixie Noel fabric and a single 5 inch charm pack! Ohh and it is also Jemima from Tied with Ribbon’s turn on the blog hop today and her beautiful Let It Snow wall hanging is as pretty as it is inspiring, so you definitely need to pop over to her blog. And if like me you love all things Pixie Noel, tomorrow the blog hop will feature makes from Andy from A Bright Corner and Lindsay from The Cottage Mama.